Dr. Andrew L Kaplan, MD is a Doctor primarily located in Fort Washington, PA. He has 19 years of experience. His specialties include Dermatology. He speaks English. Dr. Kaplan has received 3 awards. The overall average patient rating of Dr. Andrew L Kaplan is Excellent. Dr. Andrew L Kaplan has been rated by 14 patients. From those 14 patients 3 of those left a comment along with their rating. The overall rating for Dr. Andrew L Kaplan is 4.5 of 5.0 stars. Dr Kaplan did MOHS surgery on my forehead last year. Fortunately he was able to remove all the suspicious tissue and I do not have any scar at all despite the significant amount of tissue removed. The procedure started on time and the staff was very professional & polite. Dr. Kaplan took the time after the surgery to explain what was done. He is number 1 in my book ! Before/after MOHs on face there wasn't much interaction. When I asked a question about healing the nurse snapped "I already told you". I also had a precancer frozen from forearm. After 6 weeks still not healing and after a call still haven't heard back from nurse(s) re concern. highly recommended. had basal cell removed from underside of nose. 3 months post-op completely undetectabe with skin graft. 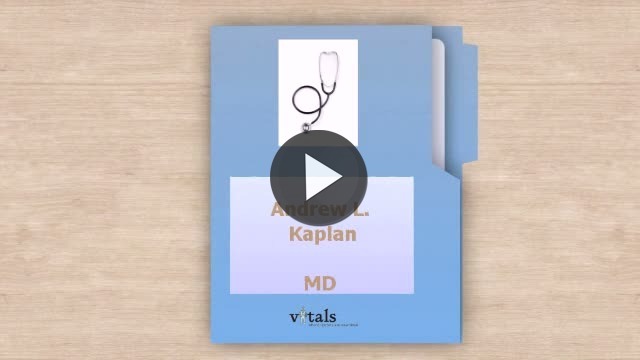 Take a minute to learn about Dr. Andrew L Kaplan, MD - Dermatology in Fort Washington, PA, in this video. Dr. Andrew L Kaplan is similar to the following 4 Doctors near Fort Washington, PA.
Have you had a recent visit with Dr. Andrew L Kaplan? Select a star to let us know how it was.